In the spring of 2015, a large Midwestern cooperative contacted CompuWeigh Corp., Woodbury, CT (203-262-9400), a supplier of customized grain handling facility automation solutions, to tackle a logistics problem related to truck traffic through a large rail-loading terminal. Harvest time had become a logistical nightmare at the terminal elevator, as trucks jockeyed for space on a single scale handling both inbound and outbound traffic. The resulting chaos backed up truck lines for up to two hours on the busiest days and created the potential for accidents. In a bid to boost the efficiency of grain receiving operations, the coop board approved a project to add a second truck scale, construct a two-story probe building apart from the main office building, and install a completely automated truck traffic management system. 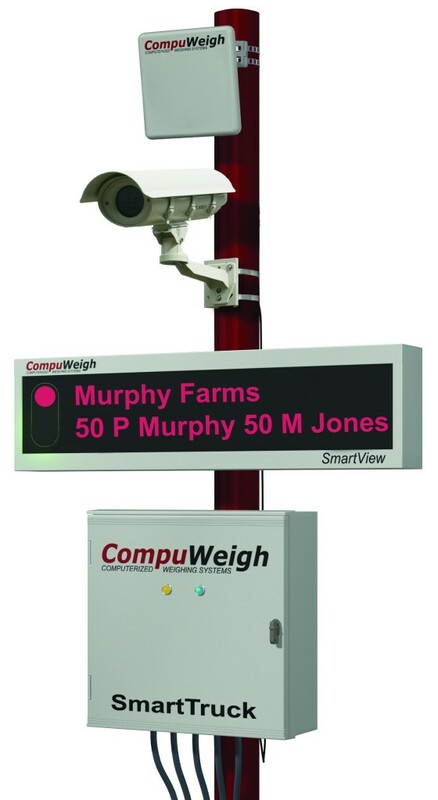 CompuWeigh’s SmartTruck system now handles truck movements on the coop property from beginning to end. Incoming grain trucks were weighed on a single 80-foot pit-type truck scale adjacent to a single-story office and grain grading lab building. A truck probe was located next to the scale. Trucks sat on the scale while the probe sample was graded. 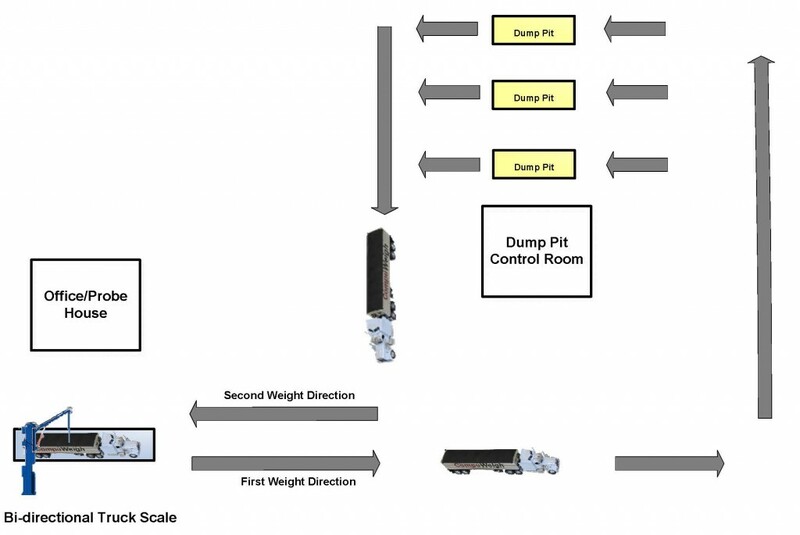 Based on those results, the scale operator then directed the driver to one of three receiving pits with a manual light system. After dumping the grain, trucks returned to the same truck scale jockeying for position with both inbound and other outbound trucks to get their tare weight. While parked on the scale, outbound drivers left the cab to go inside the office to receive their scale tickets. • Wait times were too long, and the elevator was losing customers to more efficient competitors. • Probing inbound trucks while they were still on the scale held up the line, as the driver would have to wait while the sample was graded, so the operator could direct the driver to the correct receiving pit. This also held up outbound drivers from getting their scale tickets. • The single, bi-directional scale was not only a bottleneck but also a potential safety hazard, with both inbound and outbound trucks trying to get onto the scale from multiple directions. • The scale operator had to radio grades for each load to the dump pit operator, which was a distraction and created the potential for errors. The worst of these was when the driver dumped grain into the wrong pit – say, dumping corn into a pit dedicated to soybeans – which could be very costly. • Drivers getting out of their trucks and walking into the office building for their scale tickets was a safety issue. Talkative drivers who wanted to chat were a distraction to elevator office staff. And producer members were unhappy, because they wanted the drivers to stay in the cab and get back to the farm as quickly as possible during harvest. • The lack of good traceability made it difficult to fix errors such as weighing out the wrong truck on the outbound weight. • Moving the existing probe station back approximately 100 feet ahead of the truck scale and creating two probe lanes to either side of a new truck probe, which could swivel 180 degrees to service trucks in either lane. • Construction of a new two-story probe house adjacent to the probe station. The second story allowed the probe operator to see into the trucks, without the need for a closed-circuit camera. The facility office building remained where it was. • The addition of SmartTruck technology with RFID tag recognition every step of the way. • The addition of RF antennas at the receiving pits for the installation of CompuWeigh’s SmartPit receiving pit verification system. • Construction of a new 80-foot pitless truck scale after the receiving pits for outbound trucks. A new outdoor ticket printer was installed next to the new scale. • Trucks delivering grain to the terminal now are equipped with RFID badges. This allows “last load hauled” producer information to be displayed automatically on a SmartView message board at the probe station as the truck pulls up. Drivers can see the producer to whom the load is being applied, as well as any splits. If changes are required, the driver communicates with the probe operator view a SmartTalk intercom system, and the changes show up on the message board. No more waiting for a scale ticket to confirm that everything is correct. • The SmartTalk intercom has noise cancellation technology for improved sound over the older system. The probe operator now wears a wireless headset, allowing him or her to move around the probe house, in order to operate grading equipment. • Probing ahead of the inbound scale allows grading to take place while the driver is pulling ahead to the scale. By the time the truck is weighed, grading is complete and is displayed on another SmartView message board. 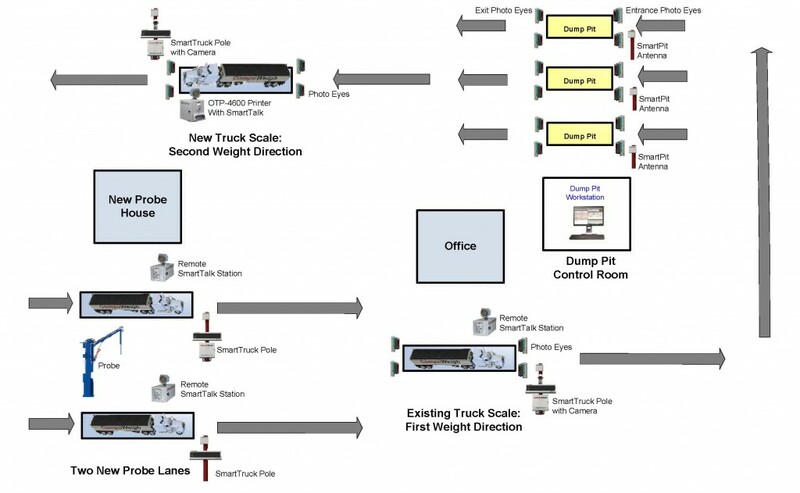 The SmartTruck system automatically identifies the truck through the RFID tag, confirms the truck is on the scale using electronic photo eyes, and uses the CompuWeigh SmartChoice module to direct the truck automatically to the correct receiving pit. The driver is informed which pit to approach via the message board. 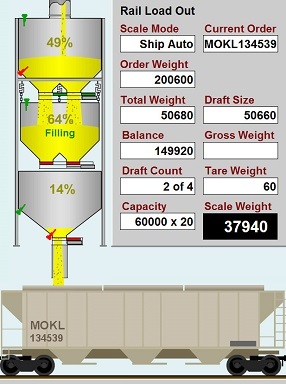 • The receiving pit operator receives instant notification of trucks that have weighed in, along with commodity and grade data, via a PC workstation. The truck RFID tag is scanned automatically before the truck enters the receiving pit using SmartPit. That way, the operator knows who is pulling into the pit and the commodity and grade of the load. If the truck proceeds to the wrong pit, an alarm sounds, and the operator has the option of shutting down the specific leg that pit feeds. • The RFID tag comes into play again at the outbound scale. The scale operator no longer can misidentify a truck resulting in multiple scale ticket errors. • Photos are taken of each truck at weigh-in and weigh-out making it easier to trace transactions. Weighing a truck now takes less than 20 seconds at either the inbound or outbound scale. That results in much more efficient elevator operations, and the producers are much happier.